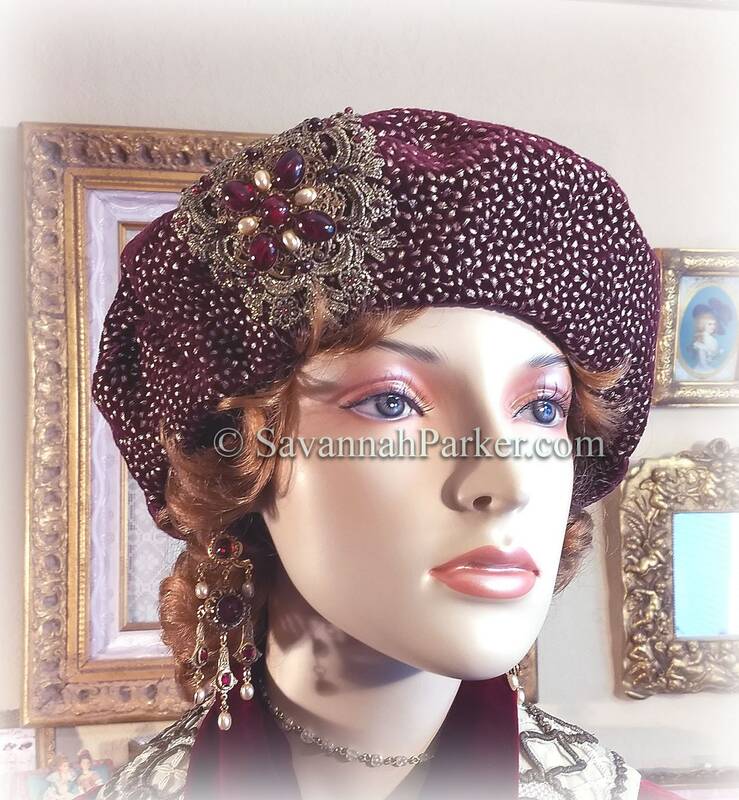 A classic vintage-to-modern style---a marvelous, luxurious and very chic French/Bohemian/Renaissance Beret in sumptuous deep garnet/wine silk velvet with allover old-gold embroidery, accented with metallic lace, genuine garnet beads and a jeweled antique brass ornament. 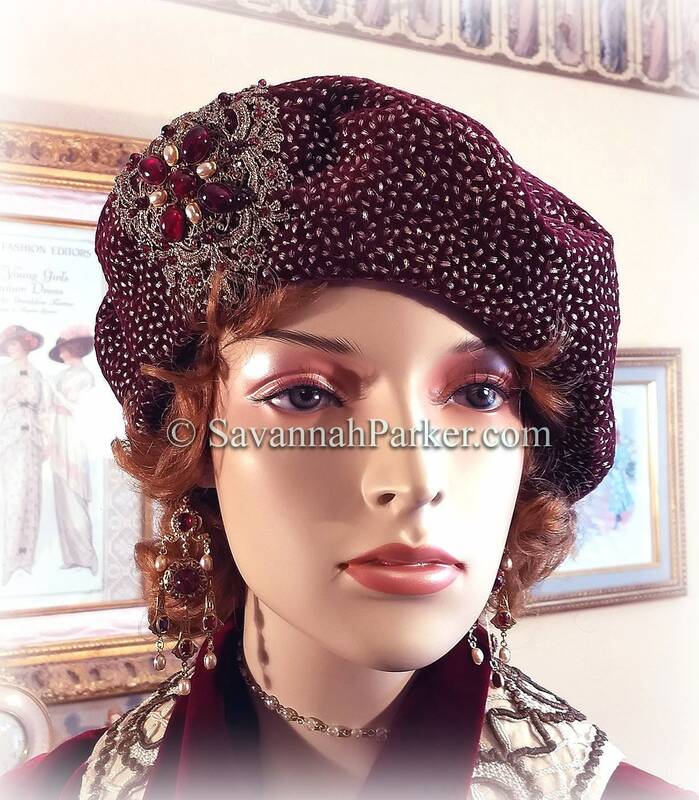 (Looks fabulous with my matching garnet/ruby earrings--available elsewhere in my shop) SO versatile, fashionable and comfortable, and unlike some other styles, the beret/tam style looks good on everybody, female or male! 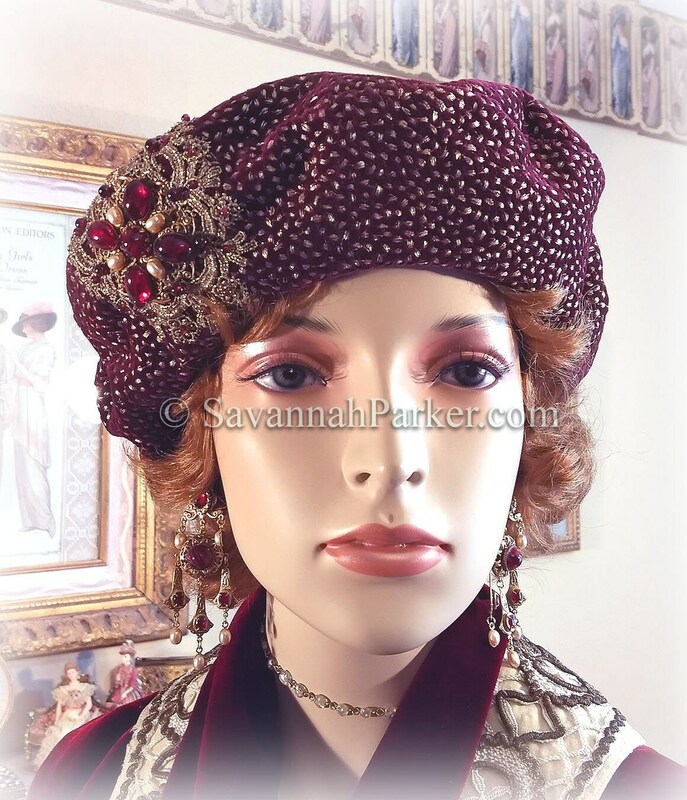 Like all of my hats, this one is exquisitely hand made from authentic vintage patterns, absolutely breathtaking pure silk materials and lavish trimmings....yet so wearable and chic today.... Just a perfect hat for any dress-up event, 1920s style New Years, tea or Art Deco party or a wedding.....and, this hat is especially wonderful for the chemo patient as it fits closely to the head and looks soooo feminine and glamorous....everyone will ask "WHERE did you get that hat, it's so gorgeous!" PLEASE READ THE DESCRIPTION CAREFULLY before asking questions! All details about sizing, etc. 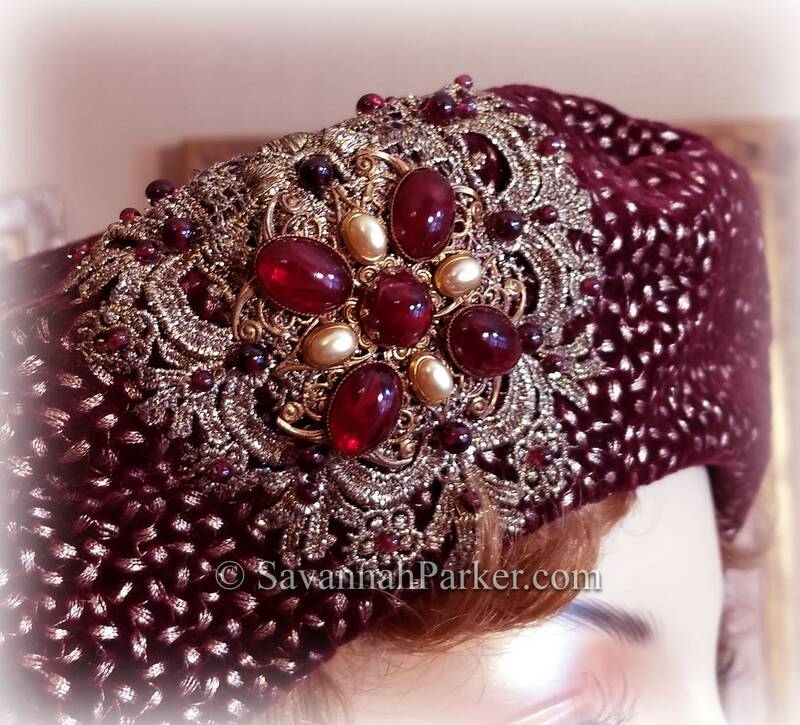 are addressed here, so it's very important to READ all of this...thank you :-) This is a made to order hat, so PLEASE NOTE there is an approximate four to five week completion time BEFORE shipment, if this presents a problem for you please do not purchase. 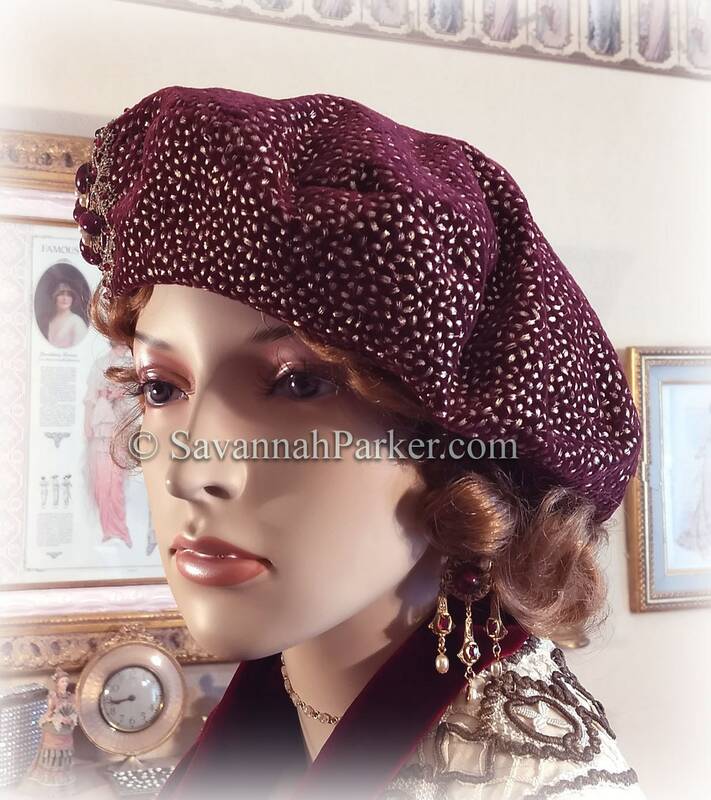 This exquisite beret/tam is made of substantial and VERY rich deep wine silk velvet embroidered all over with tiny antique-gold metallic thread motifs (be sure to see the closeup photo of the fabric detail) that has a luxurious feel and very crisp body---you can shape this hat in any way you choose and it'll stay in place.....perfect for a beret style which can be worn in a multitude of ways. This is some of my very finest silk velvet and cost over $200 a yard--it is a primo, sold "to the trade only" fabric---I've kept it for years not wanting to cut into it and decided to finally create this delicious little beauty with it..... To this elegant base I've added a handsewn accent of an intricate, old-gold metallic lace applique to which I've sewn small genuine garnet beads, then topped with a large antique brass filigree ornament which I've jeweled with vintage Czech glass cabochon stones in rich deep ruby and pearl, set in individual brass settings.....So chic and so French--also with quite a Renaissance feeling! 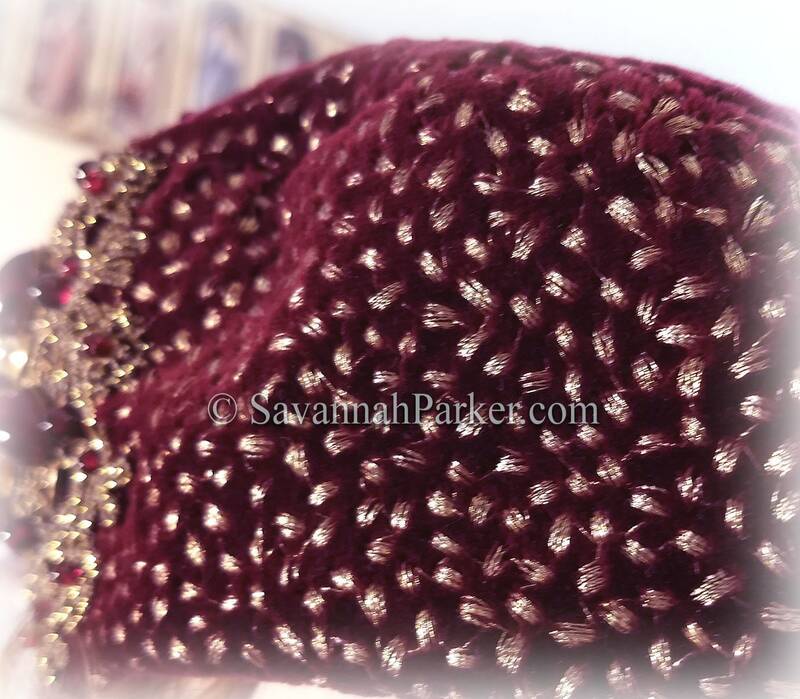 The inside edge of the beret is finished and bound with handsewn matching vintage grosgrain banding.The wonderful gold threaded design of this rich velvet gives the fabric an elegant and subtle shimmer, the beautiful accents make this piece look extraordinarily vintage and ALL of the exterior decoration including the individual decorative elements, are painstakingly sewn on by hand, just as in the "old days".....I'm a stickler for primo "old school" workmanship! 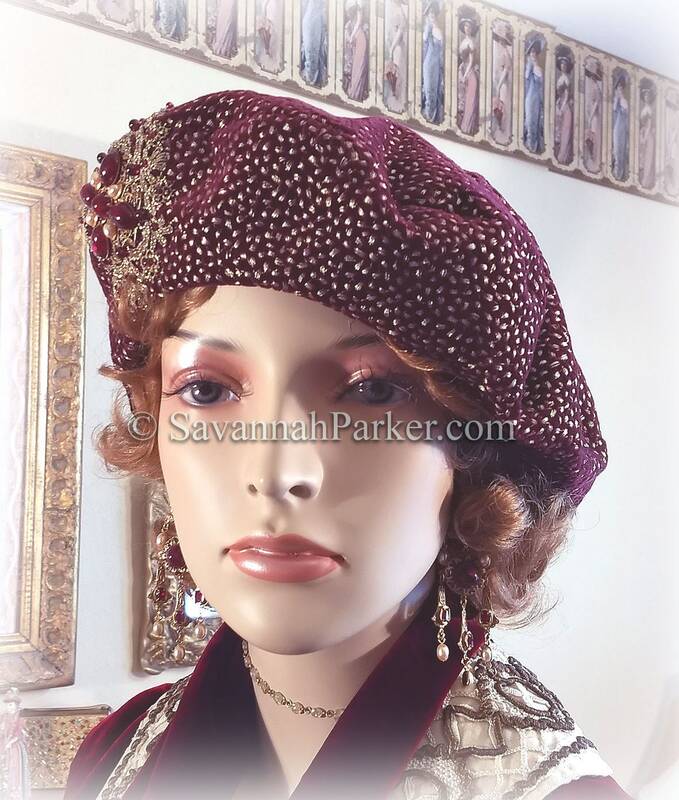 Fully lined in rich burgundy finest pure silk.....This one is a medium size and made from VERY choice rare materials in my collection.... 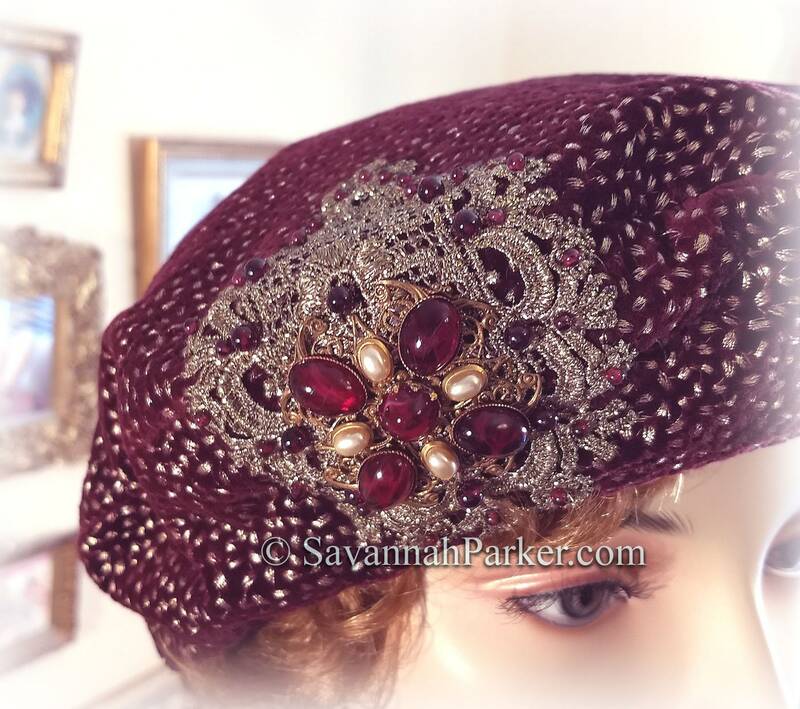 So perfect for someone who has undergone chemo too, as this is a super comfortable hat and can cover the entire head....I think everyone has the right to be beautiful--- and this would be a great gift for someone who needs that little lift and to feel so pretty....Also a great piece for anyone to wear to a Great Gatsby, Downton Abbey or Art Deco vintage themed event :-) Berets are such a truly wearable, wonderful style and since they generally pack flat, it's easy to take them anywhere! Please make sure you carefully note proper head measurements: this will fit up-to-medium sizes, it measures exactly 23" inner circumference so I would say up to a size 22.75" head could wear this, any larger than that and it would probably be too tight for real comfort, I have a 22.5 size head and this fits me nicely and exactly....if you have a small head and your hair is flat, this might be somewhat loose on you so make sure of your requirement before ordering....my mannequin has a 22" head but very thick hair and it is slightly loose-ish on her, so do keep that in mind. I have a 22.5 size head and this fits me nicely and perfectly....if you have a small head and your hair is flat, this might be somewhat loose on you so make sure you tell me if a size adjustment is needed.....my mannequin has a 22" head but very fluffy hair, so do keep that in mind; if your head size measurement falls outside this range, you must let me know when ordering. 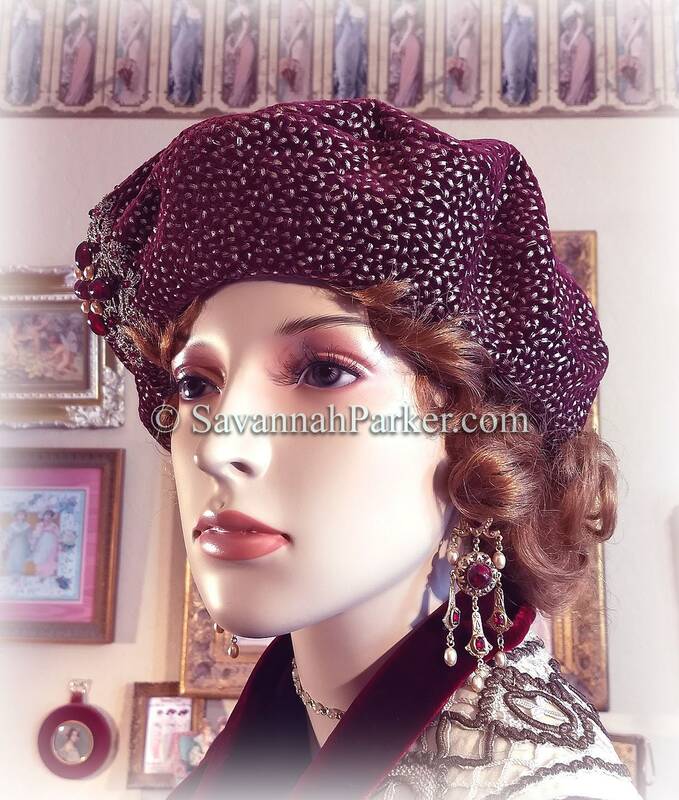 (no extra charge for larger sizes, I just need to know exact requirement in advance) PLEASE NOTE that these hats are NOT adjustable, alterable or returnable so please do know your exact requirement before purchasing as there are no refunds or returns. To take your head measurement: --use a tape measure crossed over the forehead and just above the ears around to the largest part of the head. 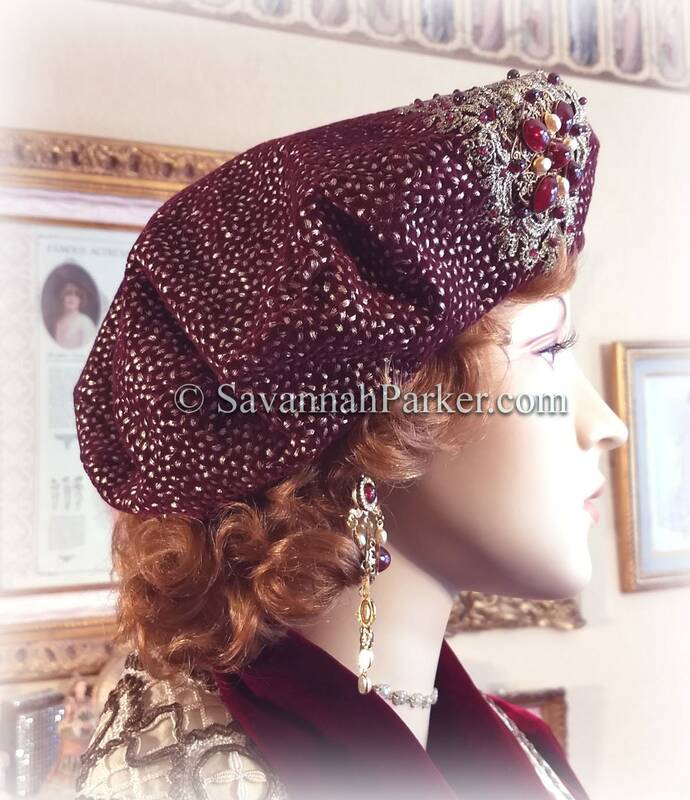 Half an inch in head size CAN make a difference so please, make sure you have exact size requirements in hand before you buy and let me know if you need special sizing. Also, please do read my shop policies/shipping info in full BEFORE you purchase (click on "policies" on my main shop page).